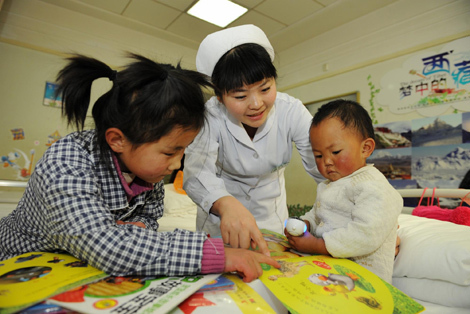 LHASA - Approximately 1,000 Tibetan children with congenital heart disease will receive free treatments by Chinese Lunar New Year in 2013, as part of a charity program aiming to cure children with the disease in poor families in ethnic minority-dominated areas. Initiated by the China Charity Federation in February 2011, the program has been brought to Tibet for a dozen times, and children who have been diagnosed with the disease have been sent to receive surgeries in big hospitals in Beijing and Guangzhou, said Xu Yixuan, honorary vice president of the federation, on Thursday. "We want to send warmth and hopes to more families and children in the region," Xu said. The plateau region, with an average altitude of over 4,000 meters, has a much higher reported incidence of congenital heart disease than other parts of China. Chinese Lunar New Year in 2013 falls on February 10.